This year has been a bit of letdown in horror with so many movies failing to deliver, but then there is Better Watch Out which delivers way more than you could ever expect. Better Watch Out is the horror movie I've been waiting for for this entire (2017) year. It's has clever, original writing in a year that has been bogged down in remakes/sequels/prequels; and delivers horrific craziness with Funny Games level dark humor. The cast is fantastic, from the parents to the ex-boyfriend but Levi Miller and Olivia DeJonge are the pillars of which this movie rests. The chemistry between the two characters of Ashley and Luke is reminiscent of Heather Langenkamp (Nancy) and Robert Englund (Freddy) in a Nightmare on Elm Street. To elaborate would spoil the movie and do the viewer a disservice. The writing, directing and cinematography are absolutely perfect. As is the horror movie that the kids are watching which foreshadows the first half of the movie beat-for-beat. And this is all set to a beautiful Christmas soundtrack; there is nothing like a good horror chase scene set to a Christmas song. 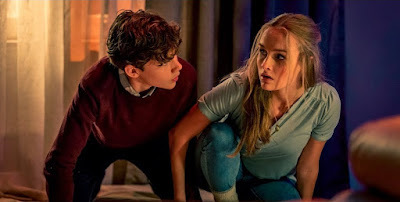 There is so much to gush over in Better Watch Out but it would spoil everything and this is one of those movies that deserves to not be spoiled. Hell, even watching the trailer will not reveal a thing about the plot. Do yourself a favor and go watch this right now, you won't be disappointed.